“Be warned, these are not songs, but sound pieces inspired by the works of artist Richard M Powers, who in the 1950s was one of the most important Science Fiction artists of his time. Prolific to the point of producing more than 1500 cover and interior illustrations, the world of the SF paperback had been truly informed by “the Powers style”. “Over the last year Andy has been sculpting and squeezing sounds in his shed to put together a collection of pieces linked to his experiences as a child where he would literally disappear into the book jacket art of Mr Powers. “Every week or so, a young Andy would go to his local library and loan out three books, sometimes the same ones, sometimes different ones. He wouldn’t read them, but instead stare intensely at the jacket illustrations and drift into these fearful future worlds, hearing unusual soundscapes and noises. In the last couple of years Andy found out that the vast majority of illustrations he liked were done by the same artist, one Richard M powers. Finally he had a name to link with his experience. “The film that, at first sight, would seem to challenge most forcefully the aesthetic framework set up by Metropolis is Forbidden Planet (1956). Its entirely electronic “score” by Louis and Bebe Barron, the first of its kind in Hollywood, is described in the credits as “electronic tonalities” and was composed at a time when the electronic music of Karlheinz Stockhausen and Herbert Eimert was in its infancy. Functioning both as music and as a sound effect track, the score was clearly designed to sound alien and futuristic. “For instance, its sounds are increasingly aligned both with references to the astounding relics of a long-dead but highly advanced civilization and, in the latter half of the film, with the monstrous emanations unwittingly created from the main character’s subconscious mind with the help of the aliens’ unimaginably sophisticated technology. Yet the score shifts effortlessly from this nondiegetic function into diegetic mode when visiting astronauts are played an ancient recording of the creatures’ music, which has been clearly contextualized in the dialogue as an alien artifact of great value and wonder. The ease of this slippage is facilitated by the largely nondramatic nature of the score as a whole, which, in its twin function as music and sound effect, maintains a flexible and discreet distance from the emotional contours of the narrative. Despite Rebecca Leydon’s claims – and even the efforts of the composers themselves— this music, through its contemporaneous strangeness, for the most part seems to be conspicuously separate from the middle-American, patriarchal 1950s approach to human relationships depicted in the film, acting as a repository of certain concerns about new technological growth that were characteristic of postwar Western culture—concerns which, typically, develop from an initial lack of understanding and na ̈ıve wonder- ment at the benefits of technology beyond those already harnessed by humankind, move through fear and distrust of its potential, and arrive at a final rejection of technology’s evil and uncontrollable superhuman power (the planet is set to self-destruct by the departing astronauts). Text: Jeremy Barham, Scoring Incredible Futures: Science Fiction Screen Music, and “Postmodernism” as Romantic Epiphany. Image: Music edit from Forbidden Planet, via YouTube. Text: Mood Media Corporation Completes Acquisition of Muzak emuzak.com DA: April 16, 2012. 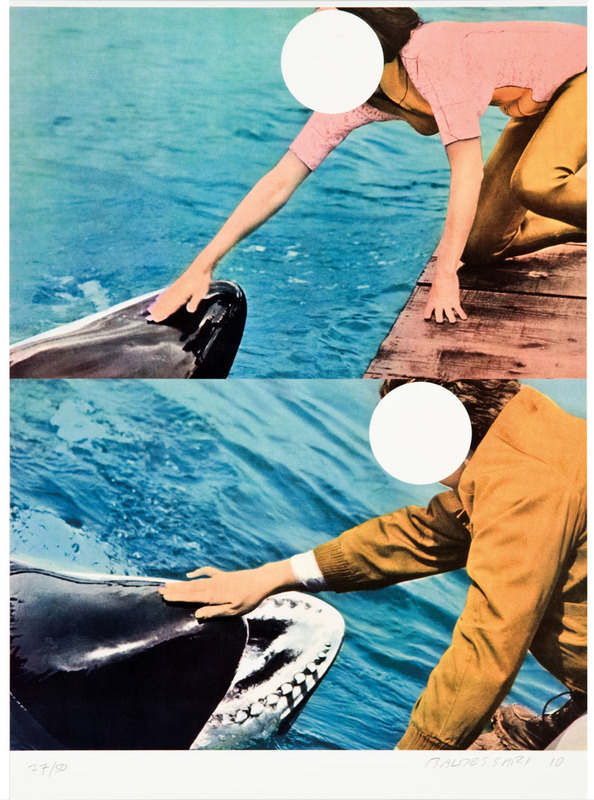 Image: John Baldessari, Two Whales (with People), 2010. Screenprint, 32.25″ x 23.625″.